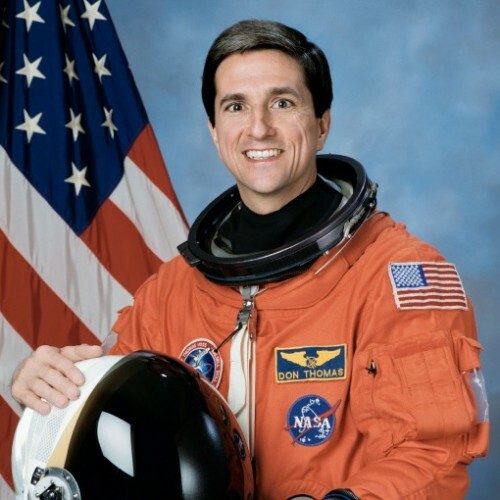 Don Thomas is a former NASA Astronaut and a veteran of four Space Shuttle missions during which he spent 44 days in space aboard Discovery and Columbia, and orbited the Earth 692 times. Born in Cleveland, Ohio, he recieved his bachelor of science degree in physics from Case Western Reserve University and his Masters and Doctorate degrees in Materials Science & Engineering from Cornell University. Before joining NASA he was a Senior Member of the Technical Staff at the Bell Laboratory's Engineering Research Center in Princeton, New Jersey where he was awarded two patents in the field of electronic pacakaging. In 2007 he left NASA and joined Towson University where he directed outreach programs intended to excite and inspire students to pursue careers in the fields of math, science, and engineering. An accomplished professional speaker, he has done programs across the United States and around the world, where he shares his experiences of being an astronaut, viewing the Earth from space, detailing the personal and professional challenges he faced becoming an astronaut, and emphasizing the importance of teamwork and leadership in achieving goals. And above all else, he shares his message "Keep your eyes on the stars" of never giving up on your dream in life. "Orbit of Discovery - The All-Ohio Space Shuttle Mission" published by the University of Akron Press, 2014. Hardcover 406 pages. Find out more about Don Thomas at http://www.ohioastronaut.com.